Business process workflow diagrams show how the steps in a business process fit together. Workflow diagrams are used to define and analyze processes, communicate steps to other people involved in a process and to document a business process flow. Moreover, mapping out a business process using workflow diagram helps to identify the process bottlenecks and show the way of process improvements. Business process workflow diagrams are highly informative because they depict the decisions and the steps that needed to be taken to improve the process. Business process workflow diagrams can also help to estimate time, and identify who should be involved in any decision. The ability to create Business Process Workflow diagrams is contained in the ConceptDraw Business process Workflow Diagrams solution. This solution extends ConceptDraw DIAGRAM with a set of 10 libraries that contains 317 vector shapes that can be used when representing the transferring of data, documents, and tasks during a performance of a business process. ConceptDraw DIAGRAM with the extended functionality of the Business Process Workflow Diagrams solution, is the ideal medium for creating designs of this type. 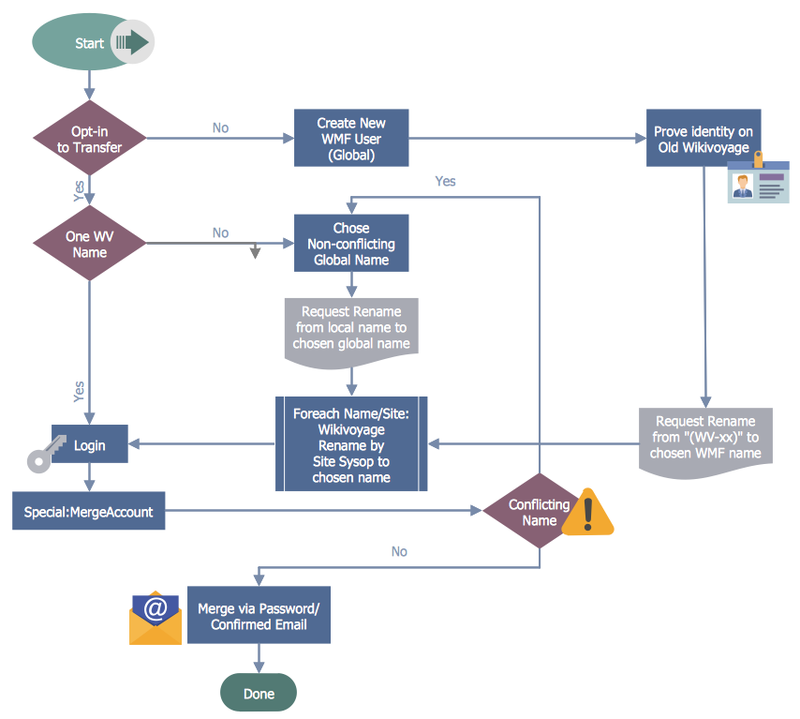 Open proper libraries from the Business Process Workflow Diagrams solution. Select an object in the library and then click on the document, at the place you want the object to be inserted. You can extend the standard library objects by customizing any item from any library and assigning it with Rapid Draw features. The Rapid Draw is an automatic drawing system intends significantly reduce the time of creating flowcharts and diagrams that consist of typical entities. Using the Rapid Draw together with the Chain connection mode, you can quickly create the set of connected objects. Add text to diagram — select the object and type. Use options provided in the Format panel to customize the diagram appearance. Organize diagram elements properly using the Arrange & Size panel. Result: With the help of a business process workflow diagram you can visually describe the tasks, documents, people responsible for execution at each stage of a business process.